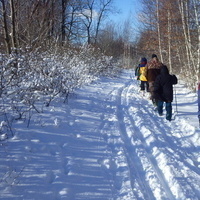 Join the Park Naturalists for an evening stroll through the interior trails of Presque Isle. Meet at the Sunset Point parking lot and we will explore Pine Tree Trail. Learn about nocturnal wildlife and park history. Please dress for the weather. Meet at the Sunset Point parking lot. My husband and I enjoyed it and very informative about the Presque Isle. We definitely do it again. Thank you for the Park Naturalists.